Home > What Is Power Up What Works > Who We Are > Alise Crossland, M.S. Ed., Ed.S. Alise Crossland (Brann), M.S. Ed., Ed.S. Alise Crossland (Brann), M.S. Ed., Ed.S, is a senior researcher at AIR with more than 13 years of experience identifying and assessing digital learning technologies for both general and special education. Her primary responsibilities include providing technical assistance and professional development to educators at the local, state, and national level on the use of accessible technology tools to facilitate access to academic content for students with disabilities. Crossland currently serves as lead content developer and co-deputy for AIR’s work on OSEP’s Center on Technology & Disability - a project focused on building the capacity of families, school systems, and providers, to understand, assess, acquire, and implement appropriate assistive and educational technology strategies and tools. 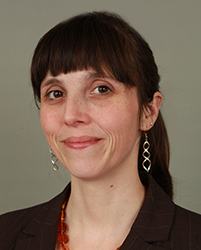 She previously served as deputy director on the OSEP-funded Center for Technology Implementation (CTI) - a project focusing on the use of evidence-based practices in technology to improve teaching and learning for students with disabilities, and as Task Leader on the 2017 National Educational Technology Plan. Crossland’s work includes the design, development and creation of interactive content and platforms, professional development materials, technology guides, workshops, webinars, and research briefs on the use of assistive, educational, and instructional technology to improve student outcomes. Crossland serves as lead content creator on a variety of learning materials for SEAs, LEAs, and classroom teachers to build capacity to more effectively utilize technology to support students with disabilities for the Center for Technology & Disability (CTD). Ms. Crossland received her Ed.S. in Assistive Technology, and M.S. Ed in Moderate Disabilities from Simmons College.